Heat a wok or large frying pan over a high heat until hot. Add the peanut oil along with the mushrooms, garlic and ginger. Stir-fry for 2 to 3 minutes or fragrant and the moisture has been released from the mushrooms. Add the Chinese cooking wine and cook, stirring, until absorbed. Add the quinoa, spring onions, soy sauce, kecap manis and sesame oil and cook until the liquid has been absorbed. Add the coriander and stir through. 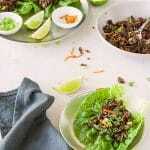 Spoon the mixture into lettuce leaves and serve with wedges of lime and red chili. Kecap manis is an Indonesian soy sauce that has been sweetened with palm sugar. If you don't have any substitute with soy sauce and, optionally, add a little brown sugar for a similar flavour.